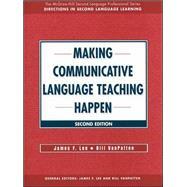 Praised for its fresh and informed discussion of language instruction and language acquisition, the first edition ofMaking Communicative Language Teaching Happenwas recognized by the Modern Language Association as one of the twenty most influential methods textbooks. The authors are both internationally recognized scholars in the field of second language acquisition research and have also written numerous successful language textbooks. The guiding principle ofMaking Communicative Language Teaching Happenis the premise that communication is the expression, interpretation, and negotiation of meaning, and not simply oral expression. Following that framework,Making Communicative Language Teaching Happenhelps instructors develop communicative classroom environments that blend listening, speaking, reading, and writing. Bill VanPatten is Professor of Spanish and Second Language Acquisition at The University of Illinois at Chicago.